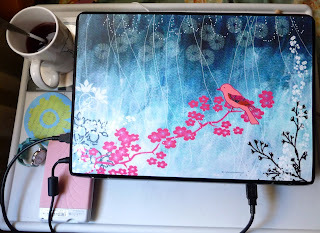 Laptop Skins by Lily Pang Art & Design! My second blog entry of the day! I felt like I really needed to catch up a bit with my planned blog entries, and since this one only needed to take a few pictures (and actually applying the laptop skin to the laptop), after lunch and a nice manderine & mango tea, I got to working on it! I found Lily Pang Art & Design shop during one of those iddle times when I decided to search Etsy around, and started playing with the Pounce feature. 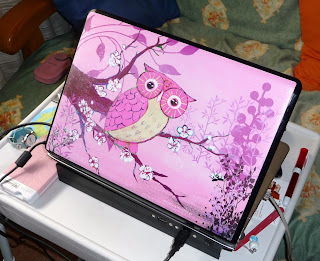 One of her laptop skins appeared, the artwork inmediately catched my eye, and I went to check her shop! 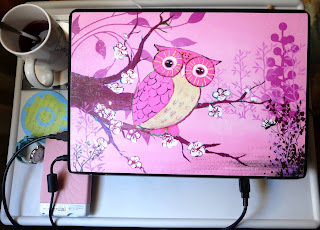 She doesn't only offer great laptop skins using her own original artwork, but also prints of said artwork. I started looking around her shop, checking all the different designs available for laptop skins (as well as for prints), also reading her shop policies, profile and even her blog! That's my usual standard procedure once I get my eye on a shop, gather all the possible information, so I can make an informed purchase. I also checked what laptop skin sizes she offered, and checked my own lappy measurements. Since my lappy had different measurements that the one she offered, I decided to convo her on Etsy, asking which of her sizes would be better for my laptop, or if she offered custom sizes. She answered really promptly, telling me she'd make them in the custom size for my lappy without any changes in price, so I could go ahead and buy the skins I like directly from her Etsy shop. One of the things that puzzles me the most, anytime I buy online, is the differences in how long it takes for something to arrive... Something shipped from the US, can take from a week to a month to appear here (customs? lazy PO workers?) and these lappy skins sent all the way from Singapore arrived in 6 days (including weekend). Lily made sure they'll arrive in perfect condition with some sort of tough and stiff plastic sheet, that ensured the envelope wasn't bent at all! The laptop skins have absolutely vibrant colours, and look even better in person! Lily sent me a convo with the proper instructions to ensure your lappy skin is correctly placed, and will look great! 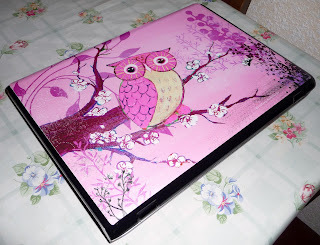 I first tried both skins on my lappy, without actually sticking them, to see which one I liked the most to try first, and I decided to go for the Pink Owl (everything pink is so typically me...). But I must say my lappy looks waaay better now! Ain't it cute? Another blog that was coming for a few days, but didn't really have the time or the will to sit down and write, but finally here it is! Kyoko from Cotton and Cloud gave my blog an award!! I'm so HAPPY! 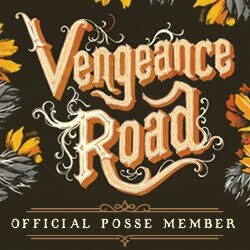 My blog got its first award!! 1. 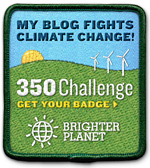 Put the Award on your blog - Done. 2. Put a link on your blog of the blogger that gave you the award - Done. 3. Nominate Five other bloggers: Now this will be hard, I love reading all the blogs! Mara has an amazing blog where she features great sellers from the DIYScene Street Team, so you can find some amazing talented new sellers! Sheika is not only a very talented artist & photographer, but she also has great new finds and featured sellers on her blog! Sofia writes about her life in Japan, and how her bussiness started in this blog, full of loads of really cute stories and interesting facts about Japan! I love Jussara's shop, and I love her products, so her blog talking about the behind the scenes and featuring new products is one of my favourites to read! I love Amber's shop, and I love her blog! Not only she talks about her shops and products, but she has recently started doing reviews & giveaways, and I love that I can find new amazing shops through her blog! 4. Leave a comment on their blog notifying them - On it! 5. List Five things that I'm addicted to: Gaurav, Etsy & shopping, reading, tea and DIYScene! Fancy a Cuppa? Teaman is what you need! 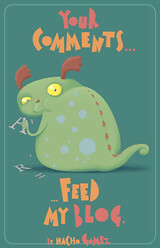 In my last blog I had plans for working more on my blog entries, since I thought I'd happen to have more spare time... But, well I had quite a few busy days, trying to get my visa for my next trip to India, which took two days, cause on Tuesday, after going to the Embassy straight from working night shift, it was closed due to a holiday. So in my day off today, I had to go back, waking up early today, and after waiting for three hours, I have my visa. In these past two days, I've been pretty tired and not getting as much sleep as I would have wanted, so my inspiration level was on low. But today I was just thinking I need to do some work in here, since this week, I've been getting a few packages, and the pending entries list is growing fast! Today's entry is gonna be dedicated to one of my shared loves with the boyfriend: TEA! 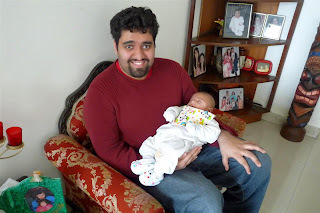 Both Gaurav and me are big tea lovers, and love to have tea daily, and trying new types of tea all the time! Being a firm believer and supporter of the handmade philosophy I started looking up for tea sellers on Etsy. I found quite a few, with loose tea and teabags, and after reading listings, and shop policies and profiles, I kinda liked one shop above the others, Teaman, but wasn't completely sure about going ahead and ordering, and at the same time, one of the girls at the DIYscene forums was asking about tea sellers on Etsy, so I suggested she tried this shop, cause I liked the sound of it, and asked her to let me know how she liked the tea. 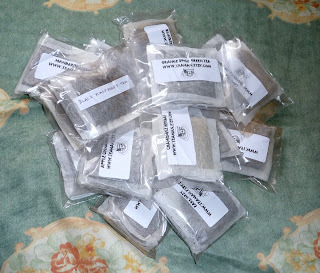 Nicole went ahead and ordered the tea, and told me she really loved it, so I decided to go check the Teaman shop again, and decided to go for his sampler set, with 15 different types of tea, with 75 teabags total for ONLY $8.50! When it arrived home, the tea could be smelt from outside the box (that arrived slightly squished, despite the efforts to prevent it made by the Teaman) and in perfect condition! Every sampler set consisting on 5 teabags of each flavor comes sealed in a zip bag, so the tea is kept fresh and doesn't lose any properties or aroma! And you get to try a huge number of amazing flavours and are able to keep them in the best conditions at the same time! I've tried a bunch of tea flavours and I'm loving each one of them! His rendition of Chai tea is really nice, and I love also the blackberry & blueberry tea! Truth be told, I haven't tried any tea that I got in this sampler that I haven't loved! I started raving to Gaurav about this tea, and was begging for me bringing some with me next month when I'm flying there, and I promised I would, and were going to pick up which flavours and how many, but after checking the Teaman's shop again, I found the 125 teabags sampler, with 25 different flavours, for $14... and I decided I was going to get that one and take it with me in the suitcase!! We're gonna be having loads of tea in this trip, and enjoying every second of it! Sunday evening, hot blackberry & blueberry tea and the soundtrack of the Fountain... the perfect setting to start writing a new type of blog entry I'm going to introduce, and alternate with my usual reviews: Shopping Handmade! 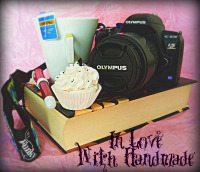 What are the "Shopping Handmade" blog entries gonna be about? Well, the idea came when I started buying, with some advance, I must admit, for some friends' b-days and presents for the bf family for my next visit. Suddenly, I realized it would be a great way to show how you can buy handmade for everyone and for every occasion, and to give a bit of exposure of those sellers I had bought from. 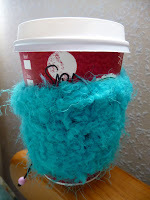 My first blog in this series will be dedicated to some members of the DIYScene forum and Etsy Street Team that responded very kindly to thread posted in said forum by yours truly, asking for some coffee cozies (or coozies as Brooke calls them). I had looked all over Etsy for those, since I love having my coffee or tea (usually Chai Tea) on the go, but I decided it was time to be enviromentally friendly, but I couldn't find any designs I really felt compelled to, or any prints/fabrics I loved, so I thought, why not ask the sellers I know and trust if they'd be willing to make some for me? And so I posted the thread, and three amazing ladies offered themselves to make me one! The first one to arrive here was the one Brooke from Crossbones Couture made out of some absolutely amazing sushi print! It's closed with velcro, backed with black felt and with nice decorative stitching; and I must say I'm madly in love with it! 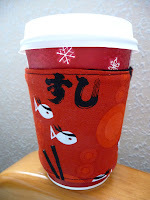 You can find more coozies in her shop, cause I must proudly say that my request inspired her, and she made a few more! Don't forget to check her out! The next one to arrive was Mara's from Indiscretion, warm and snuggly and made of some amazing blue (turquoise?) yarn and with a corset style closure with some elastic. Really cute, and perfect for the really cold days of winter, when you don't want to burn your hands, but still want your hands warm! This one I didn't purchase, she actually JUST sent it to me, and she doesn't have any coozies in any of her shops, but she has amazing scarves and clothing in both her Indiscretion & Haute Indiscretion etsy shops! The last one to arrive (and it didn't arrive alone!) was the one made by the sweet Christa, the owner of MsChrista Clothing & Hair accesories. 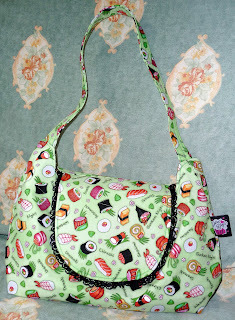 It's made of one of my all time favourites lime green sushi print! Backed with red felt, with corset style closure, with a pretty black ribbon! It even matches on of my Dolly bags and can double as a wrist cuff! 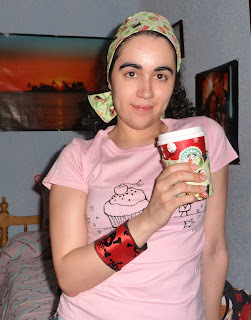 She was so uber sweet to send me a few extra goodies: a lovely matching headband, and a rockin' wrist cuff with a cool skull print! She doesn't have any more coozies, yet, cause she was thinking of making more, but what she does have is the most amazing hair flowers! And now, I'll just go back to check DIYscene, Twitter a bit about my blog, and finish my tea while I listen to some Irish music! Cheers! Finally, the weekend is here! Well, more accurately I'll be happy about my weekend OFF is here! Weekends don't really mean the same for a nurse as for regular people, since our shifts don't really go as regular office hours and the like. As usual, time off means some time to relax, catch up on my reading without losing sleep, catching up with friends and some social life aaaand of course, having time to take pics and write on my blog! I have a few entries planned, but I decided to dedicate this one to Rhiannon, the amazing girl behind Rocky The Zombie! Her line's name was inspired by her amazing doggie, Rocky (that sadly passed away not too long ago), and features her original lil zombie characters, all hand painted! She started quite a while ago on eBay, but I found her through DIYScene, the most amazing forum ever! 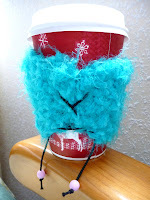 I love it, and I'm not a crafter... But I've met so many amazing crafters there, I couldn't be happier about having joined there, a year ago this month! I heard so many good things about Rhi's shop, and her designs, so I had to check it! I went to her Etsy shop, and fell in love with all her lil guys! Since she makes all sorts of clothing sizes, from baby clothing, to toddlers, to all adults size, I was waiting for a while to see if she could list some my size, but then, as I noticed she made custom orders, I decided to contact her, and ask for a few custom made tees, with the colours and designs I wanted. She was not only awfully nice, but also very helpful with providing me all info about tees and colours available and all sorts of info about the type of paint she uses and all that jazz! 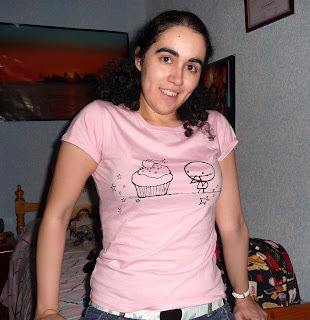 I finally went for three short sleeved tees, in pink, blue & black (favourite colours of mine) and some really cute designs, Zombie with Cupcake for the pink tee, Zombies with doggie (inspired by Fabulously Fierce's doggie Henry) in blue tee and Halloweeny Zombies for the black tee. She did an amazing job at them, and everytime she paints a design it's absolutely unique, cause they're hand painted, so no two are ever completely alike! 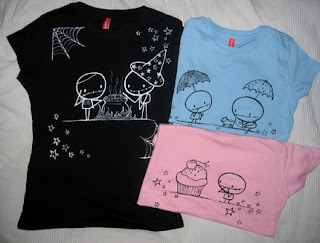 I absolutely love the three tees, and you can see me wearing the pink one! Recently Rhi decided to try a new thing, lil 8x8 inches paintings featuring her cute lil zombies! As soon as she started listing them, they started selling like hot cakes! 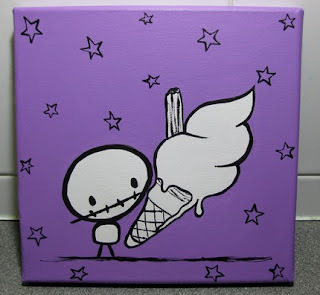 The paintings are so colourful and so cute, that they're irristible! I really wanted (and still want) to get one, two or a hundred! But, I don't really have space for any right now, and I'm trying to not buy things now for my prospective move out to my own place (one of these years), so I keep refra ining myself. So, when my friend Irene said she was moving and pimping her new place I got a lightbulb! I could buy some of Rhi's lovely lil guys, and wouldn't feel guilty over not having space and all that jazz! I got two really cute purple lil guys, with cupcake and ice cream (and I got the most unique Zombie with floating ice cream and no arms! He's absolutely too cute and won't probably ever happen again, so it's truly OOAK). I got them last Wednesday, and today I visited my friend Irene to give her the lil guys, and I was more than ready to take them back with me home if she wasn't completely in awe with them! (Un)Fortunately she loved them to pieces!! As soon as she opened the package she had this huge smile on her face, and started going through every single empty bit of wall in her room, trying to find the perfect spot for them! 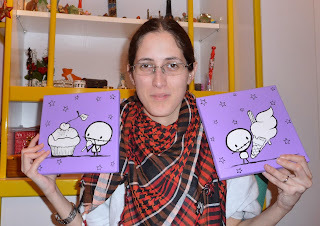 And you can see her happy self with her Rocky the Zombie paintings! I just can't wait for the moment of me being the one looking for the right spot for my own lil zombies paintings in my own place! Finally, some time off to chill & relax, and of course, to write a new blog entry! I met Heather, the one woman that does it all at Meow Kiki quite a looong time ago, when I was still buying on eBay, and she was still selling there. How I came across her? I'm sure it was through somebody's About Me page that had her link in there, and as soon as I checked her clothing, I was in love! Heather is not only an amazing seamstress & designer, but also a cutie and total sweetheart to boot! Through the pair of years I've known her we've become not just seller & buyer, but actually good friends! She's one of my compulsory stops whenever I manage to take a trip to the US, she has to take me for yummy sushi dinner! Her love for Anime & Japanese culture shows in her clothing, that has a very unique & kawaii style of its own, and the top quality of everything she makes shows in each one of her pieces! I own TONS of her clothing! You only have to look at her customer gallery on her website to see that there are a bunch of pics of lil ol' me wearing Meow Kiki originals! I started following her auctions on eBay, and then when she made the move to Etsy, I couldn't be happier! I now watch out for her new listings either on Etsy itself, or the thread she will start on DIYscene to let us know she has new awesome stuffs available. Or, I can beg and plead for some custom made piece of clothing, as she takes custom orders now and then. I was planning on taking a pic of ALL my Meow Kiki goodies spread out in my bed, but the thought of searching through both my closets and THEN having to put everything back in there scared me a bit, so I decided to just show a few of the pics I have wearing Meow Kiki clothing! The last of my purchases from her (for now) is a gorgeous gorgeous slouchy style dress, with a fantastic shiny & holey fabric, that I still haven't managed to take a pic wearing it, so this pic showing it flat will have to do (or you can check some modeled pics here) and you can also see one of the necklaces that Heather also offers in her Etsy shop, and one of the things I love when I get one of Heather pieces: the care sheet! You always get a lil care sheet for your piece, with the name of the piece and the recommended care instructions. You can punch a hole in it, tie them all together and hang it in your closet, so when you're going to wash your Meow Kiki piece, you only have to look it up, and see which one is the appropiate care for it! As of late, Heather has been focusing on offering a new look to her line, so she has been working for photographers & models to have a bigger variery of looks in her clothing line, but personally (and I know some of her old time customers do too) I miss having her modelling the clothing, cause it's the look & face I instantly recognize, but if it helps her line & sales grow, I'm all for it! Oh, and Heather, if you end up moving to Japan, DON'T stop making clothes!! Whenever I check my days off and the like in my schedule at work, I always make loads of plans about the time I'll have off to dedicate to my blog, with taking pictures and actually typing the blog entries... but I always end up thinking I'll do more than I actually do, yesterday was my day off, but I didn't manage to write the blog entry, so now, on my self-imposed schedule, I'm running on a delay... and since I'm getting a few things coming, and I'm not getting days off till next week, it might mean a bigger delay that I'd want for my blog-writting... oh well! 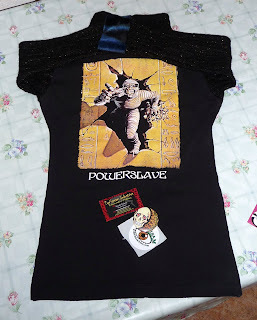 This blog entry is dedicated to the lovely Nicole from EyeScream Industries Clothing & Accesories, and the quite amazing Iron Maiden reconstructed top I've got from her! I met Nicole through DIYScene, the forum about DIY & Handmade I frequent so much, even if I'm not a crafter, and just a lover of all things DIY & Etsy addict (yes, I have to admit it, I'm addicted to Etsy!). 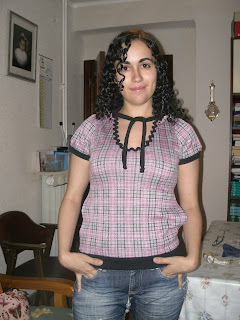 I had loads of good references from other crafters and sellers, so I knew her clothing was really good quality! So, as she mentioned she wanted to reconstruct some Maiden tees, I instantly suggested she'd do one in a medium size (*wink, wink*), and kept my eyes peeled for when she posted it in the forums for all to see. As soon as I saw it I knew it had my name all over it, so went straight to Etsy and bought it! It's an amazing original Powerslave Maiden t-shirt, with really warm 3/4 sleeves and a cowl neck with a zipper! Probably my favourite part of the top are the faux fur cuffs, so soft and really give the top the umph! 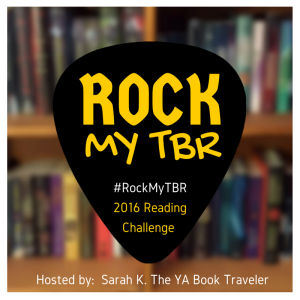 to totally rock! I looked great on Nicole's cute self, and it does fit like a glove for me! Here you can see the back of the tee, with the amazing artwork, and a pair of pics of me sporting my shiny new Maiden tee! I'm trying to get up to date with my blog entries, cause I happen to have a few pending ones, and today I added two more, since I got two more packages today! Today's blog is dedicated to one of my very first sellers in Etsy ever! As usual, with long time sellers, I don't remember how I came across Doree's shop: Pink Quartz Minerals, but what I know is that it has become my absolute favourite shop for all my mineral make up needs! I've always been a huge make up lover, I love eye shadows and the endless combinations you can whip up, for natural looks and for absolutely over the top ones! Since I started working, and having less and less social life, my make up daring has reduced itself too, but I haven't lost my love for make up goodies! My first purchase from Pink Quartz Minerals was one of her Eye Shadow kits samplers, the Fun one for Brown Eyes. These samplers are supposed to have enough eye shadow for 5 to 6 applications, but in my experience, they do have waaay more than that! I don't use my make up all that much, but I still have all my samplers almost full! After falling in love with the mineral eye shadows, and with Doree's fantastic customer service and overall niceness, I have gone back several times to get more sampler sets, for eye shadows, for blush, for bronzers, foundations... you name it! Her sampler sizes are really great for those like me, who like to have a lot of variety in small sizes cause we don't use all that much make up. My absolute favourite product from her whole shop is the Translucent Veil! This is a translucent (white looking) powder, that can be used to finish off after the foundation, or just on its own, to give you a wonderful soft glowing look. I absolutely love it! And use it a lot on its own, to just give a looking good touch. 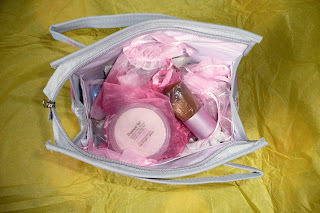 After trying a lot of her make up, I've decided to only use mineral make up from now on, and so I have a nice cosmetic bag for of Doree's goodies! Not only she offers amazing mineral make up, with hundreds of different eye shadows, and one wide palette of foundations, from the lighter possible to darker ones, one for every skin type! She also offers all kind of vegan make up brushes, in sets with make up samples or as amazing make up brushes sets. 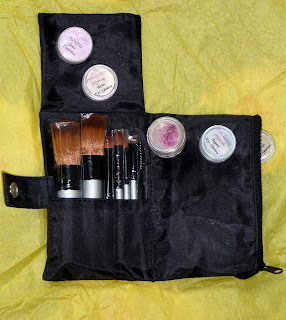 One of those sets with make up samples that I got for myself, ideal for trips and carrying around in your bag or suitcase, with seven small vegan brushes, with a compartment for keeping your most used samplers to take around with you! It's one of my most faithful companions in all my trips! I am so in love with her products that I have hooked some of my co-workers to her products, so I end up ordering for them everytime I order something for myself! Visit her shop, and I can assure you, you'll find your favourite eye shadow and your perfect foundation colour, custom made for yourself, if need be! 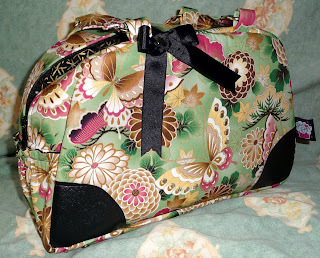 Dolly Bags & Lucky Kaeru Fabrics! 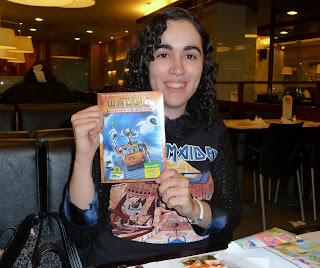 This is a very enthusiastic blog, about part of my Christmas presents this year! 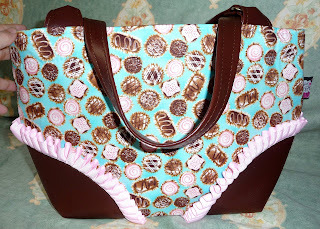 Anyone that has read my blog knows I'm a HUGE fan of Beth and her Dolly Bags (on DungareeDolly.com), and I've always loved getting custom bags from her, but I had always used the many cute fabrics she offers in her shop. 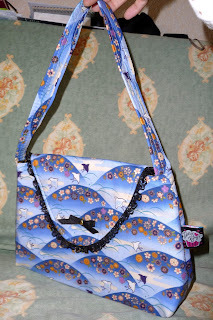 But this time I was thinking of getting some of new bags in other fabrics, that way those bags would be even more unique! The idea really started after getting a custom obi belt & headband from LoobyLou Crafts (also on Etsy) in this gorgeous green with gold butterflies fabric. 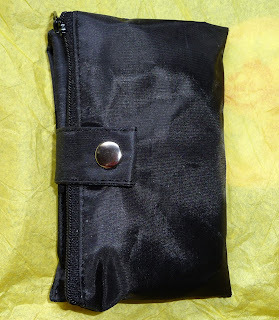 I thought that a matching bag for both in the same fabric would be absolutely perfect, so I started searching online and found the fabric and got it sent directly to Beth. 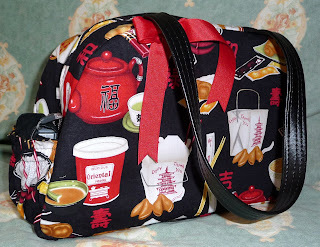 That made me decide I wanted more bags in custom fabrics, so I decided to do a search on Etsy for fabric shops, mainly looking for oriental fabrics (since I love oriental prints) and came across Lucky Kaeru Fabric shop! I started browsing the shop and found so many amazing fabrics! It took me a while to limit myself to just three fabrics, a lime green sushi one, a black chinese take out one, and a blue birds & hills one. I asked Tiffany, the shop's owner, if she wouldn't mind shipping to a different addres than mine, and was so nice and helpful and even added a lil note on the package to let Beth know the bags where for my custom order! Once Beth got all the fabrics we started talking about which fabric would be perfect for each bag, and what lil modifications would go better for each, and which lining would go better with each... quite a fun process, cause Beth is always so accomodating and always have amazing suggestions! I got the box a lil before Christmas itself, and a lil before the Spain day of gift giving, Jan 6th. Beth even included the cutest lil note telling me not to open the package till Jan 6th! So, once Jan 6th arrived, aside from all my other presents, I got to finally open the box and finally see all my bags!! Wow, what an amazing collection of amazing bags!! 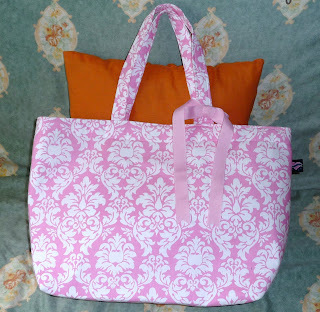 What a fantastic, fantastic package, and to top it all, I got a lil gift from Beth, in the shape of a weekend bag in the Pink Damask fabric with a matching mini bag! Soooooo pink & cute!! Thank you so much Beth!! With so many bags, I should be more than satisfied for the year, right? 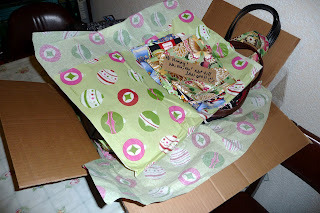 Well, I have found a few other fabrics I'd love to use to get some more Dolly bags, I know, I know, I truly am ADDICTED! Finally some time off to go back to blog writing! And the perfect day to stay home (at least till I have to go to work tonight) cause we've got a really nice snowfall, first big one since 2005! It's really nice to see snow finally over here, though it's cause loads of trouble in the roads, it took my brother 5 hours to reach from his work to his house, when it usually takes 20 minutes... But as I said, lovely weather to stay home with a warm cup of tea and write on my blog! On this cold winter day, I'm gonna be writing about the colourful flower garden of hair accesories (and more!) that is Mizu's Garden. I found her shop during a search for Japanese goods I did on Etsy. I wasn't really looking for anything specifically, but came across her shop and fell in love! Her handcrafted hair flowers and accesories, using traditional Japanese techniques with a modern twist, and using chirimen and kimono fabrics are all too beautiful! As I usually do before buying anything on Etsy I proceeded to read around her shop, profile and shop policies, and decided to contact her about the shipping to Spain (one of my pet peeves... too many sellers on Etsy don't ship internationally and some even specifically won't ship to Spain...) and she responded very quickly, saying she'd check the exact shipping with her P.O. to give me and accurate quote. And so my first flower was purchased! A beautiful White October hair fork flower! When it arrived home, barely a week after shipping I got a beautifully packed (in a gift box and all!) and securely wrapped package, and I saw how absolutely beautiful the flower is, and how amazing her craftwomanship is... I was completely hooked to her shop! 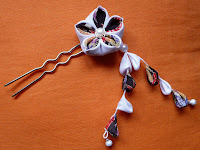 Soon after, I went ahead and indulged myself again in her shop, this time getting a gorgeous Fabric Butterfly hairclip and a stunning flower hair comb. With equally fast shipping and even a refund on the price paid for the shipping, and her amazing customer service, it's quite difficult to restrain yourself of NOT buying her entire shop! The fabric butterfly I wore during work's Christmas dinner and it was a total success! Everyone loved it! One of my co-workers even asked to get some pics taken wearing it! (if you're wondering where did I get that gorgeous hoodie/top, it's made by Mara of Haute Indiscretion). My last purchase from her shop (for now!) were a few things for myself, and some Christmas presents. 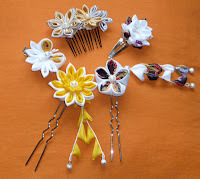 I got one of her gorgeous ribbon ornaments for a friend of mine, and then I got a gorgeous hair clip & hair fork flower for myself, and requested if she could also make the hair clip into a brooch, so I could that one for my mum. And in just one day, I had the Dream flower brooch ready to be shipped! 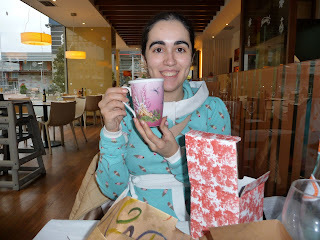 Both my friend and my mother loved their presents, and I of course loved my self-presents! ;-) Here you can see my mum very happy with her flower brooch! Now, I'm already planning my next purchases, some b-day presents, and I can't wait to see what she's working on now! Yep, I'm on a roll! Apparently having a few days off have worked wonders with my blog-writing motivation, and I've decided to write at least another two blog entries, to compensate for those two I didn't write the past week. I came across Jen, owner and designer of Jenjoy Desings, in myspace, and fell in love with the original, yummy and cute clothing she offered! At first she only sold through eBay and myspace, and she then got her own website: Jenjoy Designs, where you can find not only OOAK clothing, but also some designs in limited edition custom sizes, usually, just one of each size offered. And she even offers FREE shipping worldwide! Jen has two jobs: designer and creator of DIY & OOAK clothes and mother of two lovely girls, talk about a modern woman! 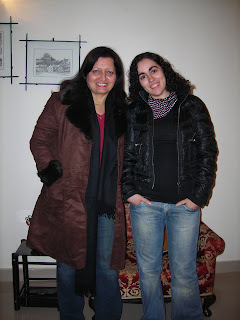 The first time I came across her clothes, I thought them a bit expensive, but loved them, so decided that the moment I could allow myself some extra money to spend, I'd try and buy something. And when I got my first Jenjoy hoodie/top, I was completely in love! The quality of her designing, sewing and finish is STUNNING! Every one of the pieces I've bought from her have been exceedingly good, and the quality of the clothing a total joy to the eyes... After buying DIY for a while, one learns to spot the good quality and to certainly appreciate it! 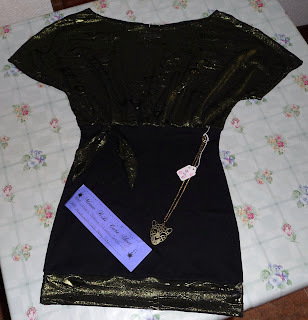 Now, everytime one of my clothing purchases arrives home, I tend to inspect the stitches and the general construction of the garment, and her clothes (amongst many others, don't worry, all will be featured here in this blog!) are always up to the test! I've bought a few of her dresses and tops, and after seeing how well made they are, the time and quality that is into them, I wouldn't say they are expensive. Handmade & DIY clothing (as well as bags, accesories and the like) as long as they have good quality, are bound to be more expensive than your regular Bershka top (for the US, think Hot Topic) but they're also made with love and are as unique as they can get! For me, money spent in good DIY is money well spent! I own a good number of her pieces, but I don't have as many pics in them as I'd like to show you, but from these two I guess you can tell how cute and well made they are! Having some time off this days, for New Years, I'm now catching up on my blogging! I found Kyoko's shop: Cotton & Cloud by pure chance on Etsy, actually while using pounce! I found her lovely shop for her handmade bags, where she had the link for her handmade knitted goodness!! 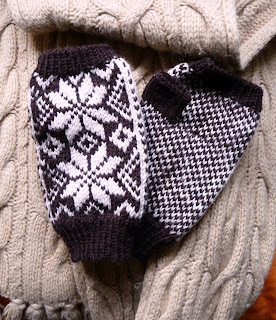 Mainly gloves and custom made baby jackets, and she also offers PDF knitting patterns! After watching her bags shop for a while, and hearting and wishing I could buy something, I took a chance with one of her sales, and got me two nice bags! A dice pouch and a pencil zipper pouch, both so well made and with lovely fabrics! 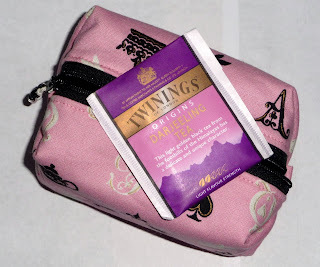 I use the dice pouch to keep my lil collection of tea bags, as you can see here! Once the cold weather arrived I started eyeing her knitted goods and thinking I really wanted a pair of her fingerless gloves, since I always get cold hands in winter, but can't drive with gloves. I got myself a pair of gray & white fingerless gloves, which not only arrive in no time from the UK, but also are as great as I expected and more! They're really soft and warm, and I don't loose grip with the steering wheel! I liked them so much that I decided to get another pair in dark mocca and light cappuccino (that happen to match colours with my most used for everyday coat, I'm keeping the gray ones to match a gray coat by Vivifromage and a black pea coat by Crossbones Couture). I absolutely love both pairs of gloves! I even decided to get a pair of fingerless reversible gloves for one of my friends for her b-day, and she's absolutely impressed with them, and love them! She said that it was the most original and creative and different gift she had been given in the past years! I'm now waiting for Kyoko to list more gloves in her shop to get another pair for another friend whose birthday is in February, cause she now wants a pair too! And I'm just waiting for Kyoko to finish a custom jacket for Gaurav's niece, Anya, for her b-day in March, and I can't wait to get the lovely knitted jacket and send it to her, and see how lovely and cozy she will look on it! I'll probably be writing a blog entry once I get pics from Anya with her warm jacket! Both her shops are amazing and filled with great products, and her customer service matches her knitting skills! Also, if you wanna say hello to her, here's her blog! It's been a while since I last blogged, but with the whole Christmas, family meetings, and work, and last minute shopping... I really haven't had the energy or motivation to blog, but since today I've got some really cute pictures from the bf I can use for a blog entry, here I am! 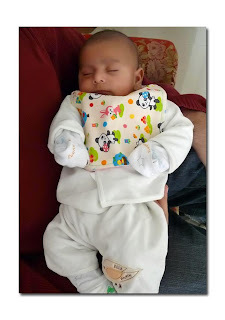 Gaurav's sister Deeksha had her first baby, a boy called Rudra, in October. I wanted to get them something for the baby, but I really wasn't sure of what to get. I had already got Deeksha a Dolly diaper bag for her baby shower, but this time I wanted something more for the baby! I went browsing on Etsy (where else?) 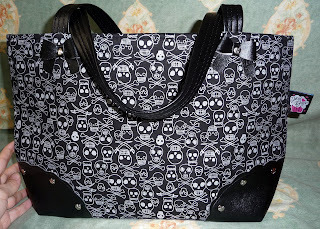 and found many great shops, but one left me a bit more impressed than the rest, mainly because it wasn't filled with the same cutesie fabrics than all the rest, but had some amazing rocking fabrics, with skullies, guitars and pirates! Also, the owner of the shop happened to be a member of DIYScene, the forums I frequent, so I also knew about her and her great products from there, so I marked RockerByeBaby as the shop to watch! I showed it to the bf, and he agreed it was filled with unusual fabrics, and all the blankets, bib & burpie sets, crib sets, they even have travel neck support pillows! I only have the bf nephew and niece to buy for, but that's my shop for all baby goodies to buy! 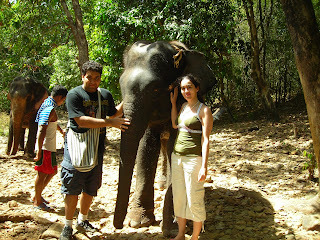 As soon it arrived over there, Gaurav gave it to his sister and bro-in-law, and they both loved it! And Rudra looks so cute with it! Here you can see a pic of Rudra with his new bib and one of Gaurav (the human pacifier) with the lil boy sleeping like an angel! 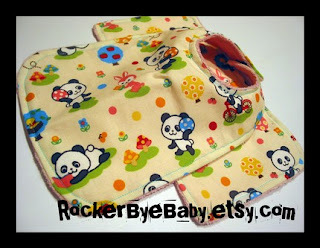 In short, if you want to buy some amazing handmade and unusual goodies for babies, RockerByeBaby is a shop NOT to be missed!